As the temperatures heat up, summer is the time you want to wear lighter scents that will better work with your body’s chemistry over heavier ones. There are so many new fragrances popping up that you may be overwhelmed. However, this perfumista has been hard at work finding the best new summer fragrances that are not to be missed like Crabtree & Evelyn’s newly launched Pear and Pink Magnolia Eau de Toilette, fresh and sensual, this fruity-floral is what dreams are made of! This heavenly blend opens with an airy freshness from juicy red pear, passion fruit, and bergamot against creamy lemon. You would assume by this lovely layering of such soft and delicate notes that it would be the scent the angels might wear. As the heart emerges, enchantment awaits the wearer as the notes of jasmine and apricot-scented osmanthus surface. When the fragrance shows its romantic side, it becomes so irresistible that it will sweep you off your feet with how elegantly this composition comes together to make you feel beautiful. As Pear and Pink Magnolia further warms and finally dries down, the fragrance reveals its tender sensual core due to the violet tones of orris in the musky base that will bewitch you and ignite hidden passion. To give you angelic hands, I recommend the Pear and Pink Magnolia Hand Therapy to keep them smooth with shea butter, macademia nut oil, and even myrrh to condition nails and cuticles. I love how that sweet scent lingers even after washing. Sweetly addictive, I guarantee that you will want the entire Crabtree & Evelyn Pear and Pink Magnolia Bath & Body Collection once you experience it. The products include Eau de Toilette, Body Lotion, Body Wash, Body Souffle, Soap, and Hand Therapy. Do pick up these products because they are a fantastic summer fragrance choice! 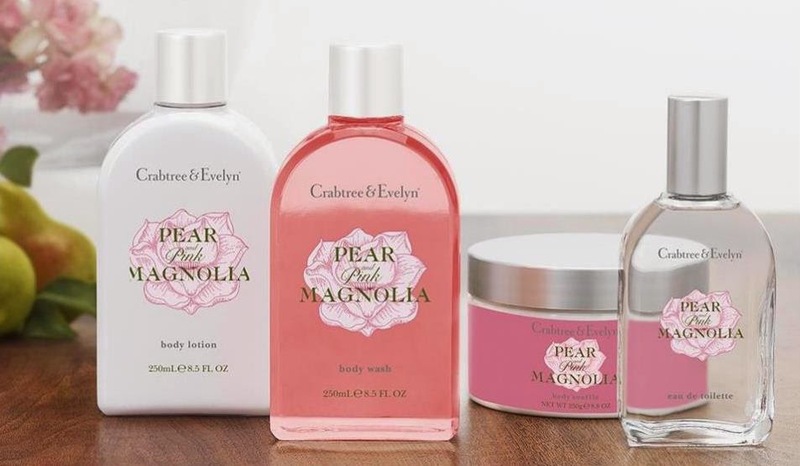 Thanks to Crabtree & Evelyn, one lucky Nuts 4 Stuff reader in the United States wins a 100ml tube of Pear and Pink Magnolia Hand Therapy ($20 value)! You must follow me on Google Friends Connect before any of your entries will count. Even if you already follow INCLUDE your ***EMAIL*** with name in a comment! Tweet #Win #Pear&PinkMagnolia #HandTherapy @CrabtreeEvelyn ($20) #Giveaway @Nuts4Stuff http://bit.ly/1lGmfm8—Ends 06/08 (Tweet up to 3 times a day, but at least 3 hours apart for each tweet. )–1 to 3 extra entries to leave in separate comments with proof. List this giveaway on any giveaway site or sites just leave a link to this post wherever you share it–5 extra entries (Get five extra entries for listing this giveaway on one giveaway site with a link to show proof of the site where that giveaway is listed in one of them). This giveaway ends June 8, 2014 at 12 PM Eastern Standard Time. The winner will need to respond to my email with name and shipping address within 48-hours or another winner will be picked. Next Post Sally Hansen’s Complete Salon Manicure Shades Perfect for Flaunting Pretty Nails This Summer (Review) + Swatches! 2. I would like to try Pear and Pink MagnoliaTriple Milled Soap. I like crabtree & evelyn on facebook. 2 I like crabtree & evelyn on facebook. 1 I like you on facebook. 2 I like you on facebook. 3 I like you on facebook. My email robyndonnelly@ymail.com. I follow by facebook as robyn donnelly. email: robyndonnelly@ymail.com I follow by gfc robyn donnelly. email: robyndonnelly@ymail.com I follow by bloglovin robyn donnelly. email: robyndonnelly@ymail.com. I follow by pininterest as robyndonnelly31.